But later Consultant surgeons were appointed to the Accident Service to cover the day and night. Accordingly, 24 hour in house coverage by a Consultant Surgeon and prompt availability of Consultants of other specialities on demand was assured, making this facility a Level 1 Trauma care centre. I always believed that the media had a very important role to play when a major incident occurs in the country. It is equally important that accurate, reliable and credible information is given to the general public through the media as quickly as possible before baseless mostly exaggerated rumours start spreading inside and outside the country. After taking over the responsibility of the Post of Director - NHSL, I made a proposal to install a liquid oxygen plant within the hospital premises itself. My proposal found the prompt approval of the Ministry of Health. All the Intensive Care Units, the Operating theatres and other Emergency Treatment Units of the hospital including Accident Service were connected to the liquid oxygen plant installed in the hospital premises. No more hassle of transporting cylinders now. Although the wards no.72 and 73 of AOS were called observation wards, they never functioned as intended. The observation wards are meant to house the patients after emergency surgical management and observe for 24 hours until they are moved to another unit or discharged from the hospital depending on the nature and the severity of injuries. Each of these wards is equipped with 46 beds. At any given time there were about 20 patients with spinal injuries in the male ward on skull traction. They remained in these wards for a long period. About 60-70 new patients were admitted to these wards daily. As a result these wards were heavily over-crowded. The female ward had a large number of patients with fracture neck of femur who occupied beds for a longer period. We found out through a survey conducted that at any given time there are about 500 Orthopaedic patients in the hospital. The number of Orthopaedic beds in AOS was not sufficient to accommodate all of them. Therefore we continued to use wards 2, 3, 51, 52, 57 and 58. Before the AOS was commissioned the Orthopaedic patients were scattered in all general surgical wards. Opening of AOS solved this problem. The Accident Service, OPD (ASOPD) had only 16 medical officers who were formed into four teams. One team with four medical officers was on duty at a time. In addition to attending on the new patients at the ASOPD they had to attend to any emergencies in the observation wards while assisting the Consultant Surgeon in the theatre. There were four separate medical officers for the ICU. In total there were only 20 medical officers for the Accident Service. This number was far below the requirement. After several rounds of negotiations we were able to recruit medical officers designated for male and female observation wards and operating theatres separately while the number of medical officers in ASOPD and ICU remained same. At the beginning Retired Consultant Surgeons were re-employed as Consultant Surgeons to the Accident Service. They worked from 8 in the morning till 8 in the evening. The Senior Registrars in Surgical Units were compelled to work on night shifts while Consultants were on call. But later Consultant surgeons were appointed to the Accident Service to cover the day and night. Accordingly, 24 hour in house coverage by a Consultant Surgeon and prompt availability of Consultants of other specialities on demand was assured, making this facility a Level 1 Trauma care centre. I always believed that the media had a very important role to play when a major incident occurs in the country. It is equally important that accurate, reliable and credible information is given to the general public through the media as quickly as possible before baseless mostly exaggerated rumours start spreading inside and outside the country. Having this in mind I tried to share the information with media as and when inquiries came from them following a major incident. I have had a repeated number of ‘stand ups’ before the television cameras to brief about the situation and explain how we have managed them. It is a very responsible task as it is of paramount importance to use carefully selected words and tone in front of the camera not showing any emotions however much the situation is critical and sensitive. I was able to convey and convince the general public that we are in full control of the situation and rest assured all the patients have been looked after well. This was factually correct. I have faced both national and international media during my tenure and the feedback was positive and encouraging. The confidence I had on my interaction with media was confirmed by such feedback. We had nothing to hide from media. We allowed them to enter the hospital when the emergency phase is over and they had the freedom to find out on their own how we managed the situation. We had a great national responsibility on our shoulders to provide services to the members of the armed forces transported to Colombo from the war-front daily. The number varied between 50 to 150 a day. These patients were flown to Ratmalana Airport and from there by ambulances to Accident Service -NHSL, Colombo South Hospital, Colombo North Hospital, Army Hospital and Sri Jayawardenapura Hospital in rotation. 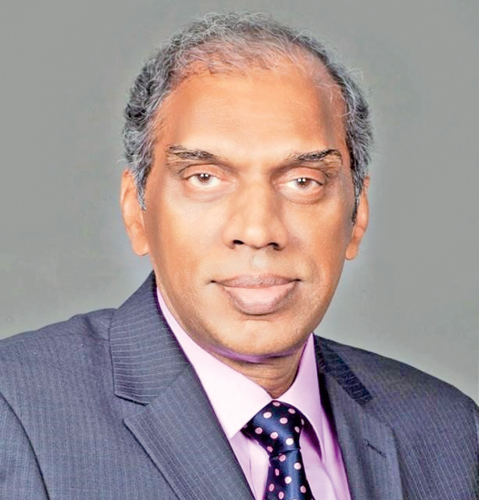 The long convoy of ambulances leaving Ratmalana Airport carrying the injured soldiers with deafening sound of the sirens travelling towards Colombo was a common sight for the people at that time. We used to receive these patients daily as they invariably had head injuries and vascular injuries along with other injuries. Most of the time these patients arrived in the evening and we had a system to distribute these patients among all surgical wards. Our dedicated medical teams were in all readiness to attend to all of them during the night itself enabling attending to the patients who arrive next day. Depending on the number of patients, we had to open additional theatres in the night and to summon additional staff who were on call. For this I had to intervene as a matter of routine. The availability of doctors and nurses in large numbers in their living quarters in the hospital premises itself and their willing readiness was very helpful. All these tasks we had to perform while providing a satisfactory service to the patients who are brought to the Accident Service due to various types of accidents and other intentional injuries amounting to about 300 a day. It was a matter of crisis management on a daily basis. 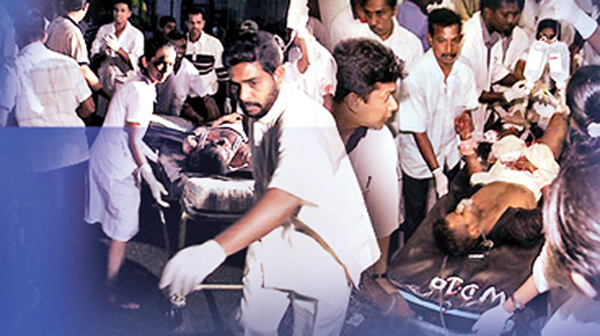 We are very proud to note that the Accident Service, along with the rest of the entire National Hospital of Sri Lanka has been in the forefront in providing emergency medical care for the victims of bomb blasts and other terrorist attacks during the thirty long years of civil conflict. The entire staff of the hospital has risen to the occasion as one with utmost efficiency and dedication, at times when the hospital is overwhelmed with patients who turned out to be innocent victims of gruesome terrorist attacks. We had a well defined, well documented Mass Casualty Incident (MCI) Plan assigning definite responsibilities and describing the ways of working for the entire staff, when there was a sudden influx of a large number of casualties within a very short period of time. This plan was tested almost on a daily basis with actual situations in the past. This Plan enabled us to grapple with any emergency situation at the quickest possible time. Most of the time we heard a bang of an explosion here or there and we have even felt the vibration of glass windows as they occurred within a few miles from the hospital. Every time we heard a sound, we thought it was a bomb explosion and we were found to be right. I very well remember how the entire staff of the Hospital got ready to receive the patients on hearing a sound of explosion or getting to know through another source about an incident. We had no pre-knowledge or alert as to how many patients would be brought and in what condition. But we were prepared to receive them. The highest number of patients we received in one single incident was a record 1500. This was following the bomb blast at the Central Bank. We worked hard and long hours as a fairly large dedicated team to provide emergency medical care for thousands of victims of these terror attacks and save lives. No matter how horrified we felt at the sight of the victims of these gruesome attacks who were brought to us, we had no way of getting into emotions. The first Mass Casualty Incident that was managed in the New AOS was the Bomb Blast at the J.O.C. on Flower Road. This happened after a few weeks from the opening. We managed it well. We have witnessed many incidents involving topmost politicians and many other VIPs in the country. I recall an incident which I cannot put behind my memory, where a political leader was assassinated of a terrorist attack. One of his colleagues who was also a political leader, came to the hospital and was crying in front of his colleague’s body. A few weeks later, that very person was brought to the Accident Service and was pronounced dead due to a bomb explosion. When the people were getting ready for the May Day rally in the year 1993, a bomb exploded in Armour Street bringing an end to an illustrious career of a politician. That was President Ranasinghe Premadasa. His mutilated body was brought along with other dead bodies to the accident service. I was terrified to see what I saw and I remembered how I stood by his side just two years ago while he was cutting the ribbon tied across the entrance to the Accident Service to declare open the new facility. Lalith Athulathmudali was shot by a gunman while he was addressing an election rally at Kirulapana and he was rushed to the Accident Service. He succumbed to his injuries in spite of all the efforts made by the Medical Teams to save his life. There was quite a commotion in the front compound of the hospital by thousands of his supporters. They demanded that they be allowed into the hospital to see their leader. Given the sensitivity of the situation, we had no option but to allow them to enter and pay respect to the leader while passing by the glass window of the ICU where his body was lying. Afterwards the people dispersed peacefully. Later on I realised that our decision was a very wise one taken to manage a crisis situation disregarding the usual rules and regulations. Extraordinary situations call for extraordinary measures. Very late in the night a female suicide bomber exploded herself during an election rally in Grandpass. Gamini Dissanayake, Weerasinghe Mallimarachchi, Dr. Gamini Wijesekere, Ossie Abeygunasekere and 54 others were killed as a result of that explosion. All the injured received prompt treatment in the hospital. A large number of doctors and nurses who were off-duty rushed to the hospital from their quarters to look after the victims of the explosion. Foreign Minister Lakshman Kadirgamar was shot by an LTTE sniper as he was getting out of the swimming pool at his private residence in Colombo. Unfortunately he succumbed to his injuries in spite of all the efforts made by the Medical Teams in the hospital to save his life. A suicide bomber exploded herself at an election rally near Town Hall, Colombo. President Chandrika Bandaranaike Kumaratunga sustained a serious eye injury and narrowly escaped an assassination attempt by the LTTE. A large number of people (118) who were injured including Prof. G.L. Peiris and Alawi Moulana received emergency treatment in the hospital. Eighteen (18) innocent people lost their lives. The Army Commander General Sarath Fonseka was critically injured due to a Bomb Blast inside the Army Headquarters and brought to the Accident Service. He had multiple life threatening injuries. His life was saved by the intervention of a highly professional, skilful and experienced team of health care personnel. During his stay in the hospital for weeks after surgery, the Army took over his security. The security arrangements were extremely tight inside and outside the hospital. Transporting him from ASICU where he was undergoing treatment following surgery to other units for certain investigations was carried out with extremely high personal security operation by the Army. This was something alien to us. There were a few instances when we had to provide our services to members or suspected members of the LTTE organization. We treated them in the same way we would have treated any injured brought to us. Any person who was seeking our services has been taken care of, ignoring the rank and file or the race. They were all equal before us. I was available all the time in the hospital whenever there was a major incident without exception whether it is during the day or night. I was very reluctant to leave Colombo thinking that some major incident might happen. Hence my movements were restricted due to my responsibilities for a very long time. I have no regrets rather I take the honour and the pride. This institution has rendered a great service with utmost efficiency to the nation and has saved many lives and relieved the suffering of hundreds of thousands of people over the years. This has been made possible by the able, willing, dedicated and committed staff of the hospital. I am proud to have been a part of it and more importantly for having given the leadership.